Most times, that which you fear is harmless, or at least far less harmful than the power you assign it. The nonvenomous snake in my image, looks pretty scary…but that is only because he is afraid, he is showing his power, he is trying to ignite my fear as I come close to him to take his picture. 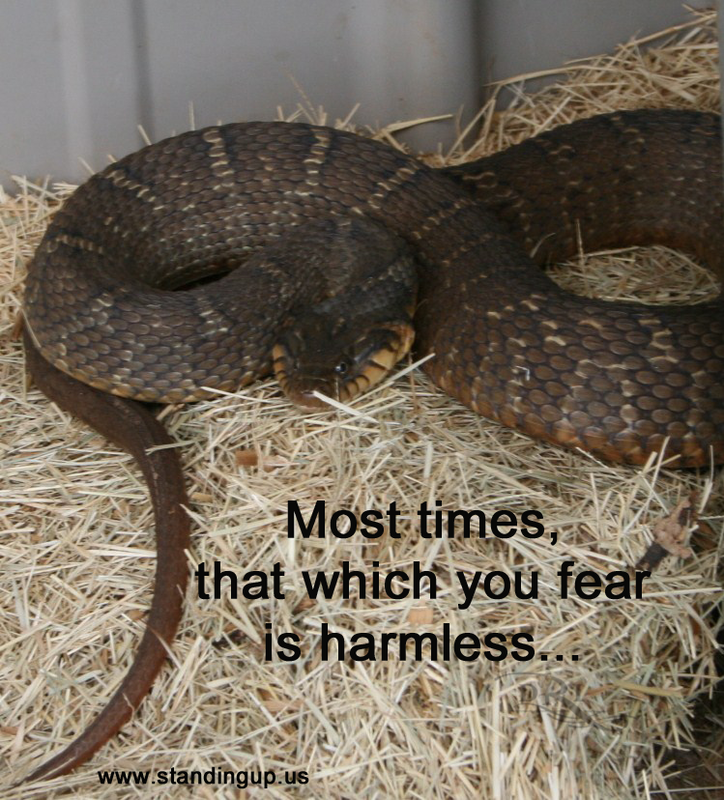 But, I am not afraid of him; he isn’t venomous. That is the goal when you are dealing with a manipulator. Don’t let their scare tactic work, don’t be afraid and they will ultimately slither away in fear of being exposed for the cowards they typically are; some more easily than others of course. This is not to imply that you are safe in your battle, instead it is to say, letting the illusion of power, control, and danger, push you into submission, may be a mistake, allowing them in essence to wrap themselves around you until you can’t breathe…rather than appropriately standing in your power forcing them to slither away for good. In the case of my nonvenomous snake, to honor him, I chose to go no closer, because I know he is just afraid and truly means no harm. But in the world of “snakes” of the human kind, honor is not in the formula in the same manner. It is not to say you should dishonor them, it is instead to say you must finally honor yourself, for they do indeed intend to harm. Handle things in a manner that leaves you feeling good about you, which can be a little cloudy at first. Standing in your own integrity permits you to act in ways not to harm, but instead to protect. To protect perhaps for the very first time—yourself. These manipulators are accustomed to you protecting them. They have trained you to run to their rescue. This is what they expect from you, because until we fully awaken we do not understand that our protecting them was harming us. We were protecting the coward, not the noble, wrongfully accused. Once they are convinced that you will allow the chips to fall as they may, by standing in truth, they will want to appear as scary as possible to you and knowing you will no longer be their guardian, they know where to go next, the weapon they will use will be shame. Of course the snake presence is not the face we initially see in our manipulator. They would never want to risk us thinking they could harm, instead they charm us under their spell…set us in delusion, and then seek to destroy us. They present the aura of all that is good, while planning our demise. Ultimately, the manipulators know of course what you fear…you being the rule following person you were taught to be, you fear shame. You can’t bear the thought of being seen in contrast to what you really are. Their focus then, is to use the shame most often caused by not being seen as a good or honorable person. They lie. And too, they wish to have you experience the shame of losing what matters most to you…a loss that might cause shame as well, a loss that would matter deeply, sadly your children, if applicable, will be the pawn used most of all, but also your money, your reputation, maintaining your U.S. citizenship, but you see, they will only use lies and deception to cause that loss because the truth cannot accomplish the goal. The challenge is that they have been planning, calculating, and building their arsenal of ammunition over time, through many pathways of deception. For the sociopath, they have been harvesting harm for later use since the very beginning of your relationship, in preparation, in case you should ever try and leave them. For the narcissist, it is more of a later thought, when they ready themselves for the inevitable discard of you, and they need you to go away. In all cases to these levels of manipulators, we are merely objects. Don’t delude yourself into believing anything else. Perhaps it is the pictures, videos or text messages they now have that they implored you to send, or that they captured the nights you had those few extra drinks when they encouraged you to just “have a break” and relax and release yourself from your structured rules and rest into their “caring hands,”:…but they were filming or otherwise documenting your momentary freedom where you, for once, let go of your over responsible self, thinking and believing you were being cared for and safe. Or they set you up by arranging for you to be pulled over on the way home so that you might be arrested for drunk driving, or they encouraged you to learn to shoot with them, then bought you a gun, so that later they can tell the cops you are armed and dangerous, as happened to me. Everything has a motive, until the very end…but it will not end until you release the FEAR. You need to remember, FEAR of exposure is WHAT THEY FEAR, and they are using it on you…they look to expose with lies, but you can expose with truth. The challenge is, you weren’t calculating and gathering evidence as they were, so your fight is harder, but far more noble, and in standing in the truth, in seeking to expose, you restore your power. It won’t be easy given the system and society is fearlessly resistant to acceptance of the truth of these calculated individuals. But it often can be done, and it requires structure of presentation. You need the chaos of your story to be documented, to be clear, to be evidenced, so that a sound mind can see the big picture of your truth. Don’t be haphazard, breathe, take your time, and pull the facts together like putting a puzzle together. Look for counsel that know and understand these individuals and have stood knowingly in their presence before…be it your therapist or legal counsel they must be grounded in the awareness of this level of manipulator, or else, you will be further diminished as you are told your truth is outrageous, as it is outrageous, yes, it is also true. Stand in it. And beware, that in the beginning as you are summoning up the courage to expose them for who they are and therefore, God forbid hold accountable these manipulators, they come back to you with a “remorseful heart,” the illusion of sorrow, the guise of forgiveness, or the promise to finally fulfill some element of desire of your heart, of the greatest magnitude, your highest wish and yet this pattern can go undetected, as we so want to believe. It is the wanting to believe that indicates you are still, what I call, “asleep.” Asleep is defined as being unwilling to accept the reality of your circumstances…it is being in denial; now THAT you should fear. THAT you should wish to awaken from. If we are willing to remain in delusion, we will have mercy and compassion, we will give them another chance, only to be further destroyed. In that new chance they will garner more evidence to support whatever false claims they choose to cast upon you, or conceal or confiscate whatever evidence you have that might expose them. When they know you are truly awake, courageous, and grounded, it will be you they fear. They are also willing to harm you. There are Danger Assessment Tools that can help you that many are certified to use, including myself. There is a way to know how at risk you are with reasonable accuracy, be aware, seek understanding. I encourage all people to read, Gavin DeBecker’s The Gift of Fear, aside from my book, Me and My Shadow, move from Fear and Control to Love and Freedom. The behaviors of these manipulators are reasonably predictable. You are smart enough to play a better game of chess, once you know you are in one, my book serves as a guide. The ONLY loss they cannot bear is the loss of the persona that hides who they are, exposure to society of who they are, and the resulting consequences. It is that loss they fear most, so shine the light of truth, stand strong and don’t let the illusion of fear (even if the fear feels grounded) make you sacrifice your power of standing in your truth. Don’t let your courage discovered when awakened, be converted by fear into compliance—being a “good little girl or boy.” You know the truth, that is the truth that matters. Stand in it. Do not waiver. It is painful, scary, and forever liberating. When we are “asleep” we are compliant, when we awaken we become courageous, stay there. I do not give legal advice, nor do I use legal principles to apply to your circumstances. Instead I focus on how to empower you to communicate and use proper positioning to win through influential and concise communications. « How Accountable are We Willing to be in Our Own Lives?